Think you could run a dealership? Visit the fantasy showroom site. So you've done the fantasy football, rotisserie baseball and fantasy U.S. Congress (yeah, you read that right) thing, and you're getting antsy for the next make-believe thingamabob to occupy your time. Why not try running a fantasy car dealership? 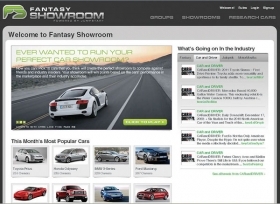 Online advertising firm Jumpstart Automotive Group has created fantasyshowroom.com, where folks buy and sell phantom cars and compete against other would-be dealers to become top cyberdealer dog. Here's how it works: You get a one-time bank account of $2 million with which to stock your showroom, and you pay for vehicles across multiple brands in each of 10 categories. You get points based on how your vehicles do in six performance categories -- such as monthly sales, market interest (what vehicles are researched online) and shopping interest (online leads generated). You can change your model lineup -- but, of course, vehicles depreciate. As in fantasy football, the player's success is determined by real-world events. Points are awarded early each month until the contest ends in August, and the person with the most points will be featured on Car and Driver's Web site.